In Edom (the biblical name for what we call southern Jordan), a Bedouin leads his camels across the desert. 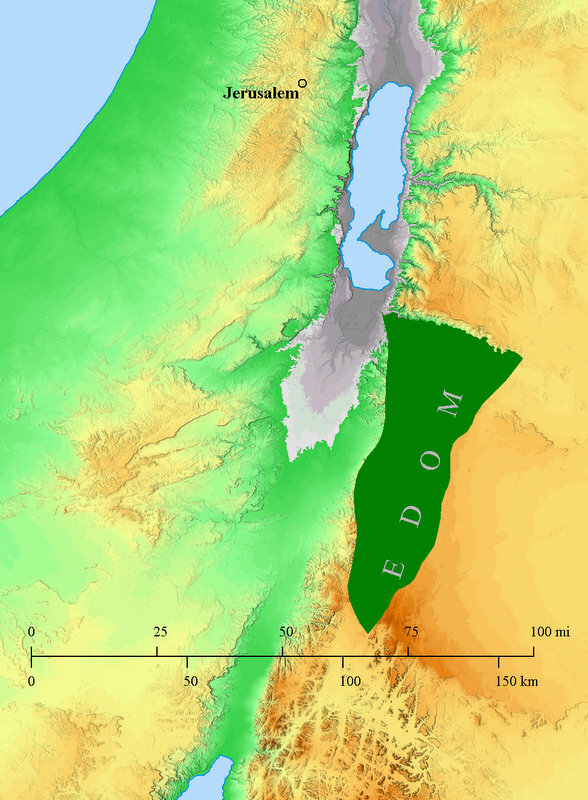 Edomites were descendants of Esau, twin brother with whom Jacob feuded bitterly. Generations later, when the Israelites tried to come through Edom on their way from Egypt to Canaan, Edomites rudely turned them away (Numbers 20:14-21). Unless something or someone creative breaks the cycle of fear and mistrust, hatred gets passed on from generation to generation. Israel’s bitterness against Edom is searing in Psalm 137, written when Israelites were captives in Babylon. Edomites—neighbors and relatives of Israel—had joined the Babylonians to destroy Jerusalem in 586 BC. This is awful stuff. But it may be necessary for such texts to be in our Bible. CNN daily gives us images as gruesome as Isaiah 63, and countless innocent people suffer. Biblical poetry puts into words the rage of people violated—whether ancient Jews conquered by Babylon, or survivors of genocide, or people pushed off their homeland. Rage texts in the Bible do not signal that the urge for revenge is desirable; it simply is normal and real. Deeply violated people need to find their experience represented within the scriptures of a faith community. The faith community must not rush wounded people past rage to premature forgiveness. Injustice needs to be acknowledged, lamented, and addressed. But the faith community also holds within its sacred texts a long-term vision of forgiveness and healing. In the Old Testament we find magnificent stories of reconciliation, such as Joseph forgiving his brothers (Gen 45). The story of Jacob and Esau (father of the Edomites) forgiving each other is compelling (Gen 33). We find prophecies about healing of the nations, and restoration of international justice (Isa 11, Mic 4). Hopes for a peaceable kingdom are what Jesus brought to practical reality with his teaching on the kingdom of God. Rather than deleting blood-and-guts passages from our Bible, we can follow the whole trajectory of the Bible story and remember that it ends with a healing of the nations. We need to be sure we are moving along God’s shalom arc toward that reconciliation, not back into the weary cycle of violence and recrimination. This entry was posted in Uncategorized by nelsonkraybill. Bookmark the permalink. I think we are looking for something that is meaningful and positive during this recent crisis in the Holy Land that we love. Thank you for your wise interpretation. One of your best blogs so far, and so timely.